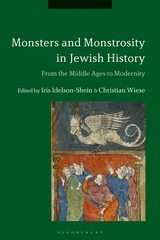 A recent, 2019 volume edited by Iris Idelson-Shein and Christian Wiese includes some very interesting studies on – as the title puts it – Monsters and Monstrosity in Jewish History: From the Middle Ages to Modernity. The first of its many contributions, by Miriamne Ara Krummel and Asa Simon Mittman, offers a creative mashup of the Old English poem Exodus and Beowolf, an attempt to rewrite the account of the Israelites’ journey from Egypt and their entrance into a land of giants via polytheistic, Germanic, and medieval legend. What prompted the authors’ quirky composition was their discovery that both Old English Exodus and Beowolf contain the same distinctive line: enge unpathas uncuð gelad (“narrow path, unmarked way”). Extrapolating imaginatively from this unusual coincidence, the authors pursue Giants down narrow paths and unmarked territory to discover what emerges from this unlikely cultural collision. Krummel’s and Mittman’s article includes sections of their creative OE Exodus-Beowolf mashup which they intersperse with critical comments on monstrosity and giants. “there also were giants on the earth in those days” (Gen. 6), Old English Hexateuch. London, British Library MS, Cotton Claudius B.iv, Fol. 13r. “The people of Israel (the Israhela cyn) lived in a Germanic land among gods and monsters. Giants roamed over the earth in those days (Entas wæron eac swylce ofer eorðan on ðam dagum). Four of these giants (entas) traversing across the earth stood along the narrow path, the unmapped way (enge unpaðas, uncuð gelad) and blocked the way forward. The troop of brave soldiers (werode wlance þegnas) hesitated. They wondered, Should they retreat? Behind them was Pharaoh’s mighty army (fyrd Faraonis) that had chased them out of Egypt. In front of them was the unknown, wandering, exilic life, as well as monsters of all shapes and sizes: giants and elves and orcs, such giants, that struggled with God for a long time (eotenas ond ylfe ond orcneas, / swylce gigantas, þa wið Gode wunnon / lange þrage). The Israhela cyn believed they were following the same trail of “magically protected ogres from the race of Cain.” For this reason the Israhela cyn sensed that they were in the presence of the “supernatural” and moved forward cautiously. Moyses, the leader of that band strong of hand (handrofra), looked up to Abraham’s god (Abrahames god) for guidance. Beside him stood his wife, Zipporah. She looked past him, past the Israhela cyn, to the other miserable ones treading the same paths of exile (oðer earmsceapen / on weres wæstmum wræclastas træd). They were like their leader, who was greater than any other man (wæs mara þonne ænig man oðer). Zipporah looked back and forth between her husband and the leader of the giants (entas), these half-human monsters. Both—giant and man—wore their woolen cloaks clasped at their left shoulders. Their tunics, trimmed with decorative golden bands, stretched to their knees, and owing to the great heat of the desert, they wore no hose. The giant’s soft black shoes were just like those of Moyses, though that much larger. Man and monster both wore their gray hair long and their gray beards forked. All raised their hands to pray—each in their own way. And so the story continues, down its narrow path, uncharted way.